Ripples in the fabric of spacetime, first brought to the world’s attention by Albert Einstein, may have been found. The rumors of the existence of gravitational waves recently made the rounds after news from a major experiment, LIGO (Laser Interferometer Gravitational Wave Observatory), which was designed to hunt for these gravitational waves, surfaced. Should the rumors be confirmed, this will become one of the most significant discoveries in physics in the last century. Lawrence Krauss, a renowned physicist working at Arizona State University, initially made the announcement on Twitter, stating that there is a 10 to 15 % chance that we just found the waves. So while there is some room for questioning (quite a bit), the mere fact that it could be possible is staggering. That said, the team behind LIGO had this to say: “The official response is that we’re analyzing the data,” LIGO spokesperson Gabriela González (Louisiana State University) told Nature. So until said analysis is done, there is little that we can do but wait in anticipation for confirmation. 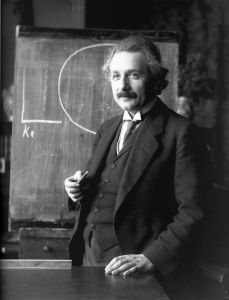 Back in 1915, Einstein tried to explain the existence of gravitational waves in his Theory of Relativity, which at the time, he believed to be impossible to test. In the LIGO experiment, which has recently been upgraded in an effort to better find these elusive ripples, it seems that the hunt for these gravitational waves may actually come to fruition. Scientists behind the study assert that, while they may be close to a breakthrough, it would be best for the world to remain pragmatic as they continue to analyze existing data. The LIGO detectors work by using a complex technique called laser interferometry: where a laser beam is split, run down two perpendicular tubes, bounced off a pair of mirrors, and recombined at the source. At this point, scientists can tell exactly how far each has traveled. Say one beam traveled farther than the other, it could signal gravitational waves. Specifically, Using this technique, the LIGO scientists can measure spacetime fluctuations that are billions of times smaller than the size of an atom; Measurements this small are necessary because the waves would originate millions of light-years away. Despite the fact that LIGO is capable of detecting such tiny spacetime fluctuations, it has yet to produce results….but that may have all changed.